Spitronics engine management system with Spitronics supplied wasted spark coil-packs. Dyno tuned by Jan Blackie at Totally Tuned in Olifantsfontein, 132kW on the back wheels at 1 500m (5 000ft) altitude! Garret turbo installed by Jan Blackie at Totally Tuned when the original unit popped at the start of the season. For comparison purposes, my 1FZ 4.5 litre EFI engine pushed out only 75kW on Shaun van der Linde's dyno last year and it is rated at 160kW! A purpose designed and built high capacity radiator was supplied by Ventura Engineering Equipment in Route 21 Park, Pretoria East. They supplied it complete with cowling and high capacity electric fan to keep the engine nice and cool thank you very much. This setup worked like a charm this season, no overheating at any stage! The fuel tank is an aluminium racing fuel cell designed by Ngena Design Space and manufactured by Elinem Engineering. Each of the two 12V high pressure fuel pumps has a Parker strainer (bought from Turboformance near Nelspruit, info@turboformance.co.za) between it and the fuel cell to prevent debris from jamming the pumps. The strainers have a coarse mesh (250micron) to reduce suction pressure drop which is a fuel pump killer! Two pumps are better than one, when one fails in an obstacle we simply switch on the other one and carry on. Downstream of the pumps a fine particle inline filter gets rid of the smaller stuff to ensure clean petrol to the common rail that feeds the injectors. Fuel rail pressure is regulated to 3bar at idle and low RPM's. When the turbo starts boosting, the regulator increases the pressure. I'm not sure to what pressure this rises as things get sort of hectic inside the cab when that turbo kicks in and there’s no time to watch that gauge! A short 75mm (3") diameter exhaust pipe with free-flow silencer. At idle it's hardly audible, at full song it makes mechanical music! Machined aluminium adapter plate to fit the “new” 3S transverse gearbox to the back of our 1JZ engine. 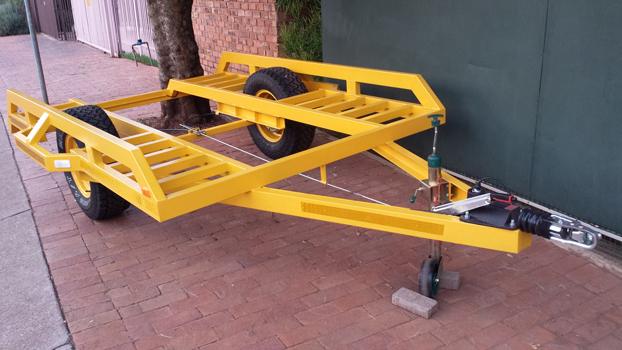 Machining by Elinem Engineering, fabrication and welding done by my neighbour and friend Riaan Delport. Machined a new flywheel that bolts onto our 1JZ crank, carries the standard 1JZ ring gear and threaded holes to bolt down the special LUK pressure plate originally intended for an AUDI V8 Quattro. Sandwiched in the middle of this lot is a Valeo 240mm diameter clutch plate that we bought for a great price from an old bike racing buddy Gavin Ross at Norbrake in Boksburg, it’s gonna be a tough life in there! Toyota 3S transverse mount 4WD manual gearbox. 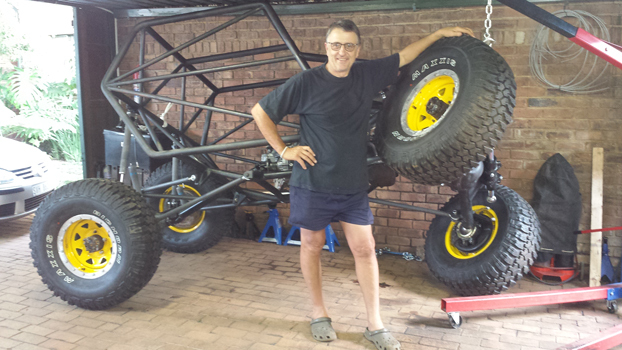 We bought a 2nd hand Toyota 3S transverse mount 4WD gearbox from Bruce Swatton at Ultimate Offroad. This unit is substantially stronger than the Camry 2.0 litre boxes used by many of our competitors. Bradbri Engineering manufactured a Gearbox Spool to replace the gearbox differential. This spool has splines all the way through the centre of it that match a Land Cruiser transfer case output shaft. Bradbri Engineering also machined a Spline Shaft from 300M ultra high strength steel that runs through the Gearbox Spool and is fitted with a Cruiser prop shaft flange on the front. 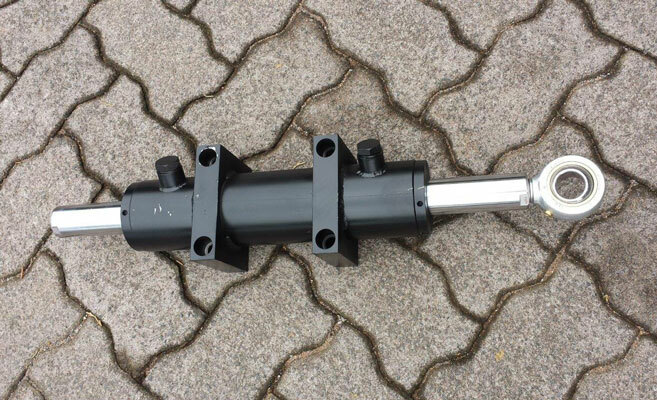 We fitted the modified Trail Gear disconnect from Kwagga to the rear of this spline shaft so we can disconnect the rear axle to spin the front around in tight obstacles. Connect / disconnect is by pneumatic cylinder supplied by Mavtech Automation in Centurion. They also supplied the valve, industrial quality Knorr-Bremse 12V compressor, air reservoir and piping. Special high torque units hand built by Bradbri Engineering in Boksburg with parts machined from billet Weldox 700 material by Bradbri Engineering and Elinem Engineering. These tough babies are sure to stop the maladies we suffered during the first part of the season!! Front diff housing started out as a Cruiser 45 unit. 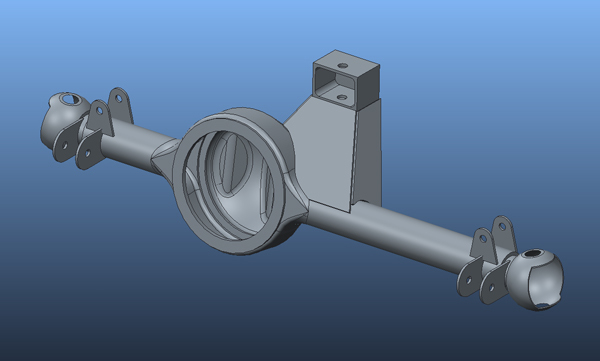 To this we added the required brackets for the front suspension linkages, hydraulic steer cylinders and coil-over dampers. We optimised the castor angle for steering feel and stability at high speed. The pinion orientation was adjusted to optimise prop shaft angles and give us clearance between the bottom suspension links and tie-rod. The front diff centre portion is a rear 79 Cruiser unit with 4-spider gears that we swapped for Kwagga’s front centre portion at N1 4x4. Ratio is 4.3 : 1. Elinem Engineering stepped up to the plate last year and imported a set of Marfield 30-spline CV joints made from Chrome-moly & 300M high strength steels. 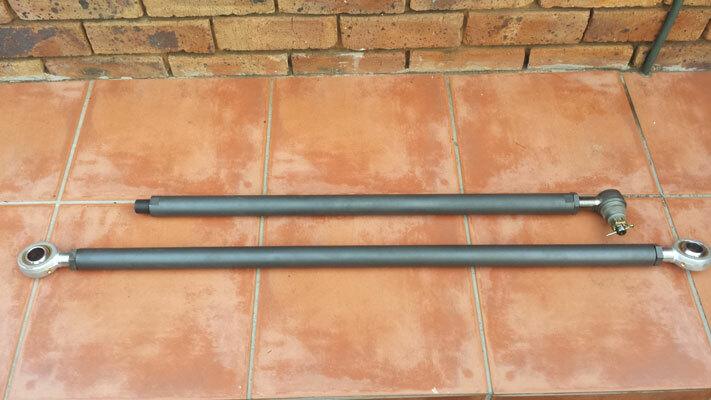 We also bought a set of front 30-spline Chrome Moly side shafts for a FJ45 Cruiser from Lynton Swatton at Ultimate Offroad in Benoni to fit into the Marfield CV’s. Lynton carries these parts as spares to all the 4XTR events so we don’t have to worry about that for the moment! The manual hubs on the wheel-ends were machined by Elinem Engineering to increase the stud count to 12, double the normal number for increased strength for when the going gets ridiculous! 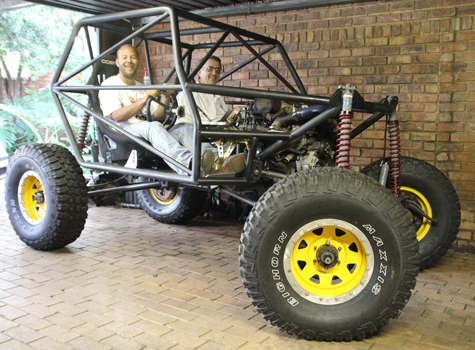 The rear axle started off as a Land Cruiser FJ79 bakkie unit that we bought from Baileys Off Road near Kyalami in 2013. The axle came from an ex-mining bakkie and its condition was shocking, but we bought it for a good price, thank you very much! The crown wheel and pinion gear teeth were super finished by hand (I did this myself with a Dremel tool, damn nearly killed me!) and shot peened by GJ Engineering to improve strength and fatigue life. 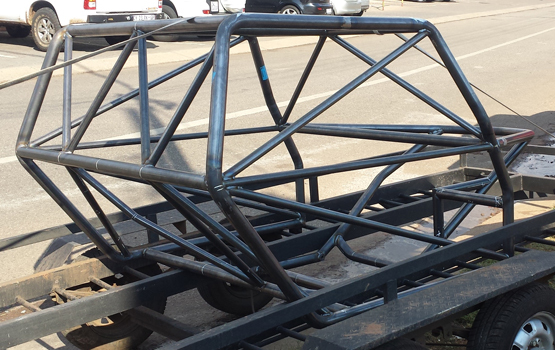 This complete axle survived nearly two seasons in Kwagga and was transplanted into Kobra. 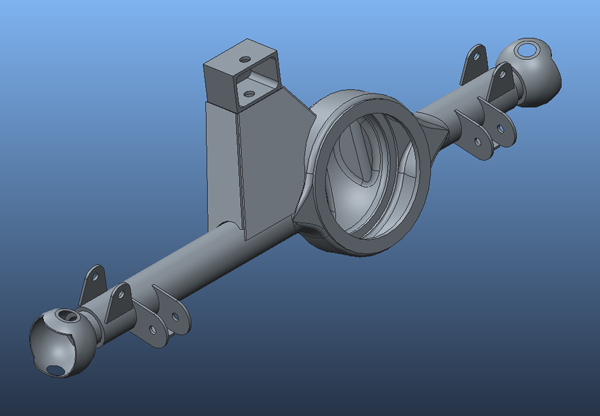 New suspension brackets were designed by Ngena Design Space and laser cut and welded on by Elinem Engineering. The diff lock is locked open with a spring during competitions, but it will be on hand when we get stuck during practice sessions. Elinem Engineering machined and fabricated the mechanism while Mavtech Automation supplied the valves, piping and cylinder to complete the conversion. It started with a set of five 6-hole Pro White 16" x 7J steel rims. As part of the rear axle upgrade, we had to convert two additional 5-hole rims with bead-lock spacer rings to fit the FJ79 5-bolt pattern. Carl van Vuuren helped to have 5mm thick Z-Factor steel spacer rings that were laser cut by Mechatrans in Benoni (complete with 16 x 8.5mm diameter bolt holes) welded to the outside face of each rim. Added to this are new light weight Z-Factor aircraft grade aluminium bead-lock rings machined from flat plate by Elinem Engineering. These are clamped onto the tyre bead with 16 x M8 high tensile bolts and Nyloc nuts per wheel. Tyres are Maxxis MT762 Bighorn 315/75 R16, the best in the business! We run the rear tyres on 0.3bar and the fronts on 0.4bar pressure to get the best traction and side slope grip without the tyres folding under. * Monotube Nitrogen charged dual acting hydraulic damping. * Thick 18mm diameter piston rod. * Remote reservoir fitted with foot valve to ensure consistent compression damping even at very high (>2m/s) piston speeds. * Special integrated hydraulic bump stops over the last 50mm of travel to drastically reduce the load on the axles and the vehicle in general when we hit something hard, which happens often! * Short overall length versus stroke thanks to the gas piston that sits in the remote reservoir. * Top and bottom mountings are high capacity spherical joints with double-lip seals to keep out the dirt. The absence of rubber in the mountings improves damping control, especially over ripples. Coil springs are Eibach units supplied by Eibach in the UK. 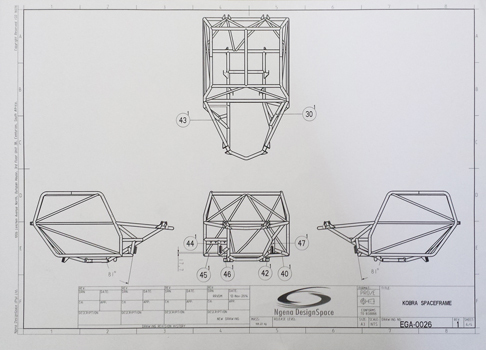 We have designed special 4-link suspension layouts on CAD for both front and rear with the knowledge we gained on Kwagga with the help of Ngena Design Space. Bradbri Engineering supplied the suspension link arms (made from solid 35mm diameter EN19 Condition T spring steel!) , spherical rod-end bearings and adapter bushes. 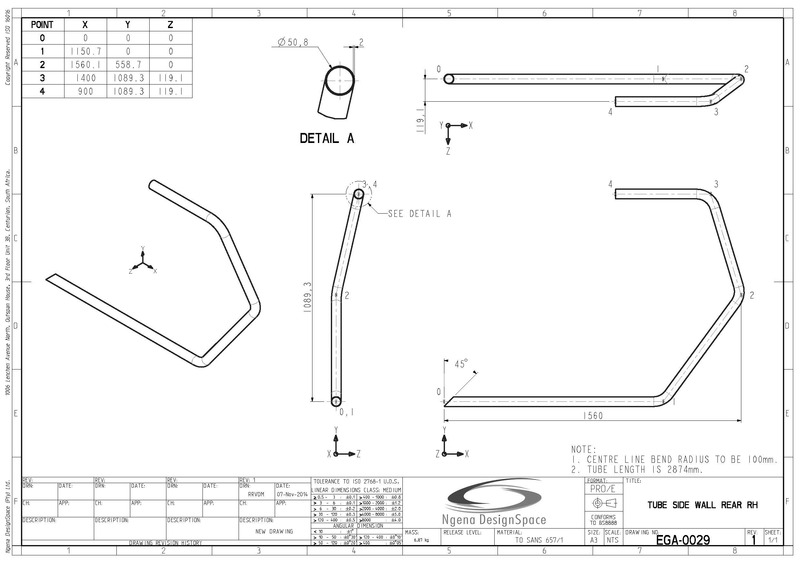 The brackets to mount the suspension elements to the axle tube and space frame chassis were also designe on CAD by Ngena Design Space. 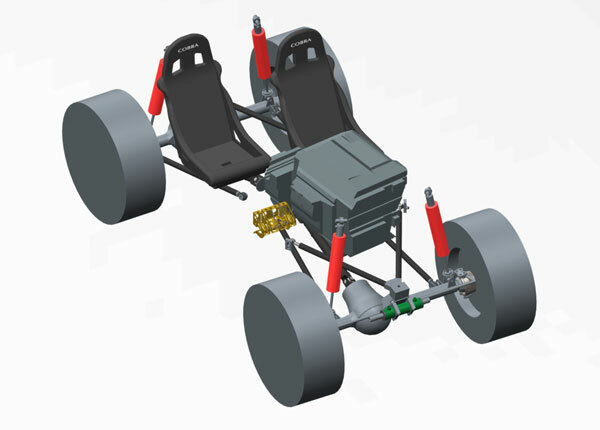 The steering cylinder was designed iteratively between Pro-Hydraulics and Ngena Design Space and manufacture by Pro-Hydraulics. They performed the calculations on the correct size and configuration orbital valve which they also supplied to us. We fitted a high capacity ZF steering reservoir and had to do some serious internal changes to the Trail Gear steering pump bought from Ultimate Offroad to get it to deliver the required volume flow so Arno can steer Kobra properly and quickly even at low engine rpm. 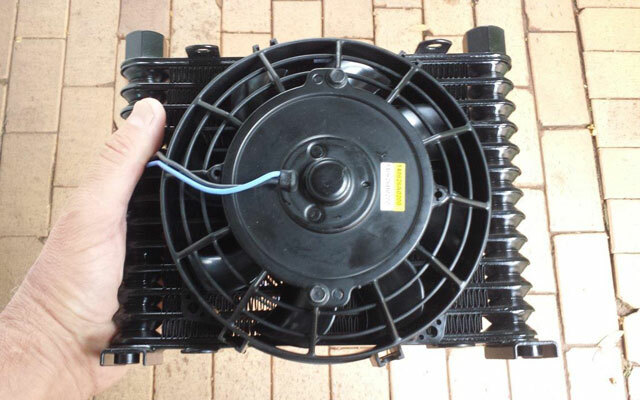 A steering oil cooler and 12V electric fan fitted to it was supplied by Ventura Engineering Equipment was mounted near the orbital valve in the return hose to keep things cool and is doing a great job! A special in-line OBP hydraulic hand brake bought from ATS Motorsport in Randburg is fitted between Arno and me and helps me to brake the rear wheels when we disconnect the rear prop shaft to help spin the front around in tight turns. This is backed up by the normal cable operated mechanical hand brake that acts on the rear drum brakes. 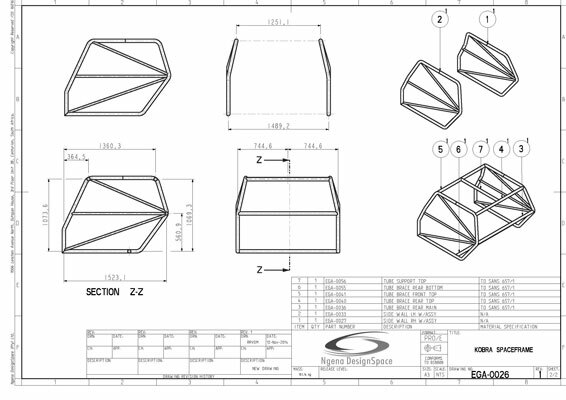 CAD design done by Ruann vd Merwe at Ngena Design Space. The tubular space frame was fabricated by Delberg Engineering primarily from 50mm round tubing with a 2mm wall thickness. The mountings and gussets were be laser cut and welded on the frame by Cactic Manufacturing, a sister company to Elinem Engineering that assists us with machining of components. The final fitments, brackets, floor plates etc. were manufactured and fitted by KooZ and my neighbour Riaan Delport. We were also helped by Arno and other friends to get everything built in time. Cobra racing bucket seats from ATS Motorsport in Randburg. These units served us well in Kwagga and were transplanted onto the aluminium floor plates designed by Riempies Riaan Pretorius and fabricated by Elinem Engineering.